The twine around the lids was just the thing these cookies needed to give them each a finished look. 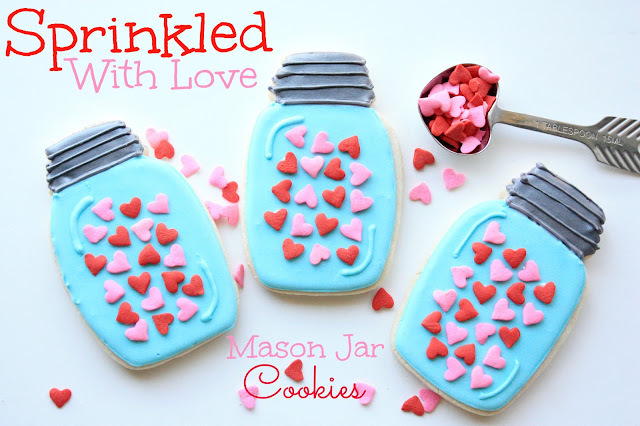 I just LOVE the mason jar cookie cutter! Roll out sugar cookie dough to desired thickness (I roll out 3/8-inch thick). Use cookie cutter to cut out cookies, and place on cookie sheets. Bake cookies at 350 degrees for about 18 minutes, or until the edges are turning golden brown. Mix the royal icing and set some aside for the gray icing for the lids. Mix the remainder of the royal icing (aqua blue) for the jars. Using a #3 tip, outline the cookies with the blue. Let dry for about 15 minutes. Outline the lids in gray (a drop of the black food coloring added to the white royal icing) and let dry for about 15 minutes. Fill (flood) the jars with the blue icing, and the lids with the gray icing. Let dry for about a half hour and then add the details to the lid (#2 tip) and the jar (#3 tip). Let cookies dry completely. With a small paint brush, apply the silver luster dust to the lids. Fill an icing bag with the blue royal icing, fitted with a small tip (PME 1.5). 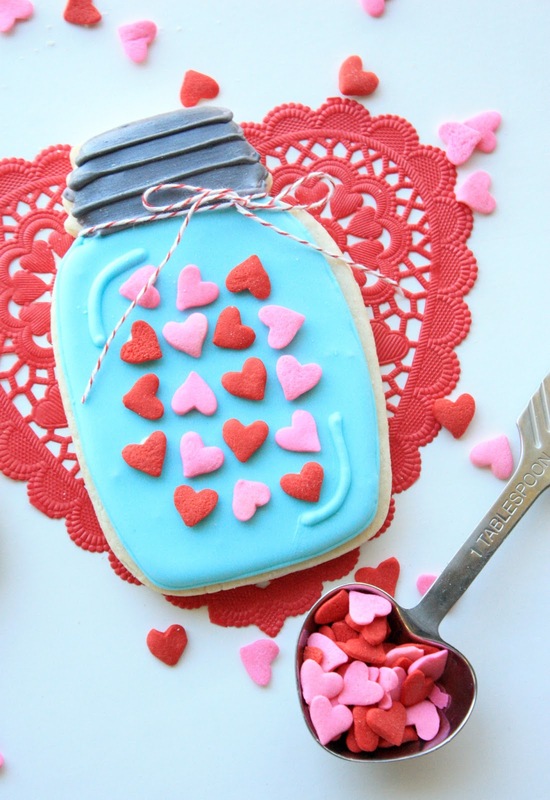 Apply a small amount of royal icing to each heart sprinkle and place it on the cookie, until the jar has been filled. Let dry completely. Tie some twine around each jar lid. Time to sprinkle some love on family and friends! oh! i LOVE this! especially the contrast of the blue and pink heart sprinkles! Sue, I'm in love with these adorable cookies! Do you happen to remember where you got the jumbo heart sprinkles? I have trouble finding larger sprinkles and the size of these looks perfect! Jennifer, I've had them for quite awhile, but I'm almost positive that I bought the jumbo sprinkles at Michael's. Good luck, and thanks for your comment! I love, love, love the color combo of the bright blue with the sprinkles! As well as the fact that these are just so DARN adorable!! Oh these are just adorable!!!!!! Love those colors!!!!! And I love that tbs measure! So cute! You have the cutest cookie cutters! These are adorable. I love the look of the little hearts too. Fun! Sue, these jar cookies are amazing filled with 'hearts'! I have old blue mason jars it my kitchen. I love these. So creative. These are just gorgeous!! And I LOVE your measuring spoon! So cute! These are really cute. Love the turquoise and the baker's twine was the perfect finishing touch. So adorable! I love this shade of blue! I love that turquoise! So pretty. And the jar idea is so cool! I love everything about these cookies!! They are just way too cute! SERIOUSLY SO CUTE! Found you on Lil' Luna's link party and I'd love for you to come link this up at my Tuesday Time Out that is still open! I love it! What adorable cookies, Sue! I can see so many ways to vary them for different holidays. Great idea!! I love these! Such a cute idea and so beautifully presented, as always. The twine is the perfect finishing touch and I really want a tablespoon like yours. Oh my gosh, these are adorable! What a cute cookie, I'm not sure I could eat it. =) And your presentation is amazing. Found you over at TidyMom and I'm off to look around some more. If these are this cute, I can only imagine what other awesomeness is here. I'd love for you to share these with my readers at my <a href="http://whilehewasnapping.blogspot.com/2013/01/weekend-wander-110.html>link party this weekend</a>! They are just too cute! Hope to see you there! Wow, those cookies are so adorable, I don't think I could eat them! And your Tablespoon... LOVE. Where did you buy it? Found your recipe on Pinterest! =) So cute! So, so cute... I love the pop of the hearts against the turquoise... so pretty! These are darling! Like the "sprinkled with love." Pinned! Oh my! I swear you have the cutest cookies around the blog-land! I'm amazed every time I visit your site. These are so adorable and so festive for the V-Day. These are aborable!!!! Love them! Sue these are adorable!! What a cute idea! I love mason jars and these are way too cute! I think I need to get me one of those mason jar cookie cutters but I'm sure mine wouldn't be as cute as yours! Love these! Hahah these are too cute! LOVE! Oh my goodness. These are simply too cute!! LOVE! These are seriously the cutest cookies I've ever seen! Where did you buy your mason jar cookie cutter? I can't believe no one has asked you that in the comments- from what I can tell! Saw you cookies on Pinterest. Very pretty. This is very impressive! I used one of the pictures of your post for my cookie decorating inspiration for this valentines. Great blog. These are so cute and look yummy too! I would love for you to link these up to The CSI Project. The challenge is Valentine Treats and Eats. You can link up today and tomorrow. They're soooo pretty Sue. Those colour combos compliment in every way. These are the cutest...i wouldnt even eat them lol they are little pieces of artwork!